The war between humans and crocodiles has gone on since the beginning of recorded history. While in many cultures they have been hunted for food or to make items out of leather they are also destroyed to get rid of these strange looking reptiles. Since crocodiles can strike very quickly, humans often don’t have time to get out of the way. The larger species of crocodiles are the ones that pose the biggest danger to humans. They are believed to be responsible for many deaths out there, but the exact number is unknown. In fact, many missing people in areas where crocodiles are found are believed to have become the victim of them. 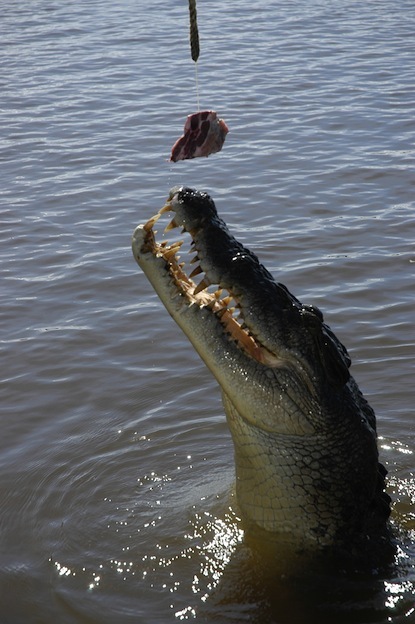 The stomach contents of some crocodiles have proven that they do consume humans. However, these animals certainly aren’t out there to feed off of them due to any desire for human blood or flesh. That is a myth that continues to heavily circulate though. Crocodiles will instinctively do what they can in order to survive though. This man include eating a human if they haven’t had a meal for some time. It can also include injuring a human in order to have time to get away without being harmed themselves. Many people assume a body of water is safe to swim in or to wade in if they don’t see crocodiles on the shore. If the water is known for them though you need to stay out of it. They can be fully submerged and it will be too late by the time you realize it. They can fold up their legs under them so they only need about a foot of water to be completely hidden. Most people that are bitten by crocodiles have wondered into the wrong place at the wrong time. If the jaws of the crocodile can be opened up then a person has an excellent chance of survival. However, it is instinct for humans to struggle and that can cause the crocodile to hold on even tighter. Many people end up drowning in the water due to the struggle. Most attacks with humans occur during the mating season. The crocodiles may have had less food than before due to looking for a mate. They are also more aggressive at that time due to the increase in hormones. A person is safer against a crocodile on land than in the water. However, you do need to careful around crocodiles on land too. Usually what you encounter will be a female. She will be creating a nest to deposit her eggs or carefully guarding her eggs. If she thinks your presence puts them in jeopardy then she will attack without any warning. The crocodile is a very dedicated predator though. There are numerous reports of crocodile attacks on children as well. They may be with a group of adults. However, they are singled out as the one that is the most vulnerable and can be taken down the easiest. It is due to such reports that humans and crocodile seem to always be butting heads. This is especially true in areas where humans continue to invade the natural habitats of these animals.